BERNIE SANDERS: I don’t think it’s a question of high or going low. I think it’s a question of telling the truth. The truth is you have a president who lies all of the time, a pathological liar. I don’t think that’s what the American people want. You have a Republican leadership in the House and the Senate that tried, it came within one vote, of throwing 32 million people off of their health insurance they currently have. You have leadership there in the House and Senate that wants to do away with the pre-existing protections that people have in this country so they can health insurance when you have cancer or heart diseases. You have leadership in the House and Senate led by the president that provided massive tax breaks for the wealthiest people in this country that for a ten-year period, 83 percent of the benefits go to the top one percent. You have a president and Republican leadership who supported a budget which would have cut Medicaid by a trillion dollars, devastating for the elderly people, Medicare by $500 billion, social security and trust disability trust fund by $72 billion. You have an administration that doesn’t even recognize the reality of climate change. I think what we have to do is be aggressive in telling the truth that you have a Republican leadership that’s working overtime to benefit the wealthy and the powerful, while ignoring the needs of working families. TAPPER: I guess the debate is, I don’t think there is any Democrat official who would disagree with what you just said. The debate is how aggressive — should people who are Republican officials be disrupted when they are eating a meal at a restaurant? Is it appropriate for protesters to be banging on the doors of the Supreme Court? That’s really what the debate is about. 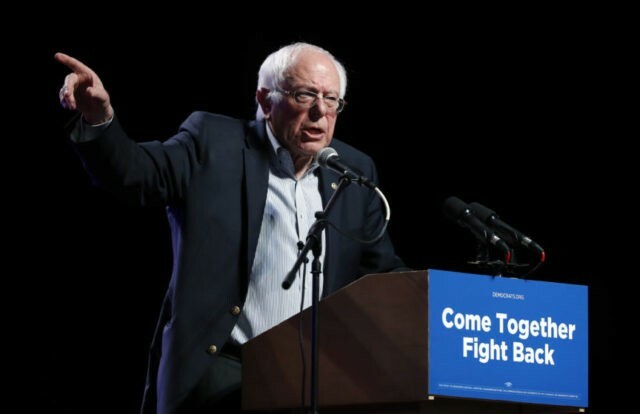 SANDERS: I am very strongly in favor of mobilizing the American people to stand up and fight for economic justice, social justice, and racial and environmental justice. I think we have to mobilize people. I am not a great fan of being rude or disrupting activities, but, this is what I will say. This entire 2018 election is going to come down to two words and that is ‘voter turnout.’ If you are out there and you’re sick and tired of what’s going on with the very rich getting richer while the middle class continues to struggle, then you are not going to have to get out and vote, but you’re going to have to get your friends and your families to vote.